Haven't been able to ride as often as I normally do, due to money. Seems we have a credit card balance that went crazy. I'd like to blame it on the wife, but the fact is that I'm just as guilty, spending money on luxuries. So I said we each have to sacrifice something to save up money and get this debt paid off. I decided to cut my joy riding in half, which not only consists of buying gasoline, but buying food and drink, and the maintenance costs associated with riding. She's giving up going out to breakfast every morning. I'm just doing one ride a week now. Normally, I'd take a day or two off during the week to go riding. Since I work at home, and work for myself, and don't have clients to answer to, it's giving me freedom to jump on the bike. But for now, I'm here at home working from morning to morning. While I'm not riding during the week, my friends still are. And here the days are beautiful in Southern California. They're riding up to Big Bear, or riding out to Palm Springs, and just today they rode out to the coast for some pizza. I get to hear about how great the ride went, see the photos, and hear about the food. And then today, another friend of mine invited me on a ride up to San Francisco, leaving this morning and coming back Saturday, with stops in Monterey, Sacramento, Yosemite, and back home. I just love those spontaneous overnighters, and hanging out at some bar far from home, drinking down brews with a buddy. For a moment I wondered how I could justify this ride to my wife. I even imagined her sympthazing with me, and forgetting about this debt that we have to pay off. I thought maybe she'd tell me that I should go, because after all, this is my thing, riding motorcycles. But I also imagined her calling me a hypocrite, particularly after I yelled at her for going out to IHOPs and Denny's every morning for breakfast. So I just said "no", I can't make it. Other guys in our riding club mentioned feeling the pinch. One guy said he'd prefer to pack a lunch, and then stop at some park after a long ride. Another person mentioned that there's nothing wrong with hitting up a fast food joint. Personally, I love fast food. We get coupons in the mail all the time. Another buddy of mine is planning a coast to coast ride this Summer, but has already expressed concern due to shortage of funds. It's been his dream to do this ride, but yet he says he's walking on eggshells trying to keep the wife from throwing a fit. To the motorcyclist, Southern California is a mecca of awesome roads for riding. But to get out of Southern California, a rider must traverse through a 100+ miles of hot, boring desert. Riding through horizon after horizon of straight road in triple-digit temperatures tests the patience of any rider. It becomes a question of how to keep oneself mentally entertained. And so I decided to practice riding without holding the handle bars. Admittedly, there's a little bit of arrogance in doing this, because other motorists will look at you with interest, and you just love knowing that you've captured their interest. But it's also a lesson in getting over the fear of riding. Once you've come to understand that a moving motorcycle always wants to keep moving forward, it opens up a new set of possibilities in testing the limits of what can be done riding a motorcycle in this manner. From Chiriaco Summit to Blythe, along the I-10 of California's lower Mojave Desert, is about 60 miles of mostly straight freeway. I tried to ride the entire distance without touching the handle bars. Here and there, the freeway does make turns, very wide turns that don't require any slowing down. I could make the bike turn simply by using body english to make the bike lean to one side. Once you've got that part figured out, you can pretty much ride for as long as you have gas in the tank. 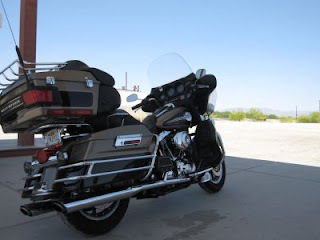 On my Electra Glide Ultra Classic, I found it easier to kick my feet up on to the lower-fairing, and then recline back so that my hands rest on the passenger hand rails. By pulling on one of the hand rails, I found it easier to make the bike lean. Not only that, but it makes my back feel a lot better. It's like sitting in a recliner, and using your body as a joy stick while playing a car race video game. I discovered my bike always wants to drift to the right. I think it's mostly due to the camber of the road. The road is not perfectly flat. That is, each side of the road is angled slightly, allowing water to drain off to the side. I think that's why the bike drifts. Other factors include side winds, or not having cargo evely distributed, or even not sitting perfectly center on the seat. I also discovered that I can ride the motorcycle without touching the handle bars, and go over bumps with no problem. Like I said above, a moving motorcycle always wants to keep moving forward. Even if you were to hit a pretty sharp bump, the tires might leave the ground, you might bounce around, but the inertia will keep the bike on a forward path. 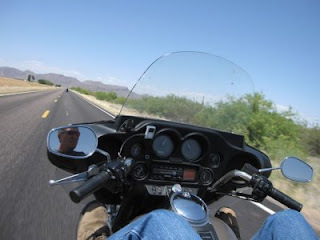 My motorcycle has cruise control, which of course makes riding without hands possible. You could do it with a throttle lock, but the cruise control adds the feature of being able to trim your speed. The "+" and "-" button on the controls allows you to speed up or slow down without having to touch the throttle itself. I noticed that when I increase my speed, the bike tends to straighten up and stay in a straight line. But when I maintain speed, then it'll start drifting to the right. Passing a semi-truck will cause the bike to drift away from the truck. That is, when passing it by, the wind that bounces off the front of the truck will push against the side of the bike, and force my bike to drift off course. And so, I have to add some heavy "body english" to counter act. So while I tried to ride the entire 60 miles between Chiriaco Summit and Blythe without touching the handle bars, I found I couldn't do it. There were places along the way where the side wind was great enough that it blew me too hard towards the other lane that I had to grab the handle bar to correct my path. There were also places where traffic slowed down enough that it became too dangerous to ride that way. But still, I probably did something like 58 of those 60 miles without touching the handle bars, I just couldn't do 58 continuous miles. How many miles have you been able to do?